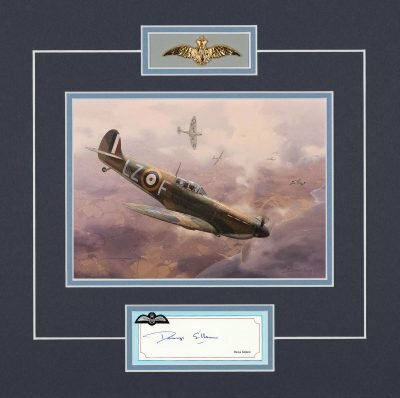 The original signature of a highly decorated Battle of Britain Hurricane pilot, Squadron Commander and Wing Leader who flew operationally throughout WWII. Dennis Gillam saw action in France and over Dunkirk flying Hurricanes with 616 Squadron. In the Battle of Britain his squadron destroyed six JU87 Stukas on a single day. Among Gillam’s many combat successes was the fastest air victory of the war. Gillam later commanded 615 Sqn then the first Typhoon Wing, taking part in the D-Day landings and the drive across Europe. I was flying at 17 and after joining the RAF in 1936 I was trained on Avro Tutors, Hawker Harts and Fury’s. After training I went to 29(F) Squadron in Egypt where we tried to intercept Italian bombers flying to Abyssinia. When we returned to the V.K. I was posted to the Meteorologjcal Flight at Aldergrove. Soon after the outbreak of war I joined 616 (South Yorkshire) Squadron, Auxiliary Air Force, as a flight commander. In May, 1940, we fought over Dunkirk with varying degrees of success, but on 15th August, when we had returned to Leconfield, we had a field day when we intercepted a formation of Ju 88’s, without fighter protection, off Flamborough, and destroyed eight and damaged several others. In mid-August, when the Battle of Britain was reaching its climax, we were sent to Kenley and took part in the furious air fighting over southern England. We had a very rough time at Kenley with many pilots being killed or wounded. On 2nd September I was hit by the rear gunner of an Me 110 and had to bale out. On the following day we were down to three operational pilots and the squadron was taken out of the line. My score during the Battle of Britain was six confirmed, four probables and six damaged. 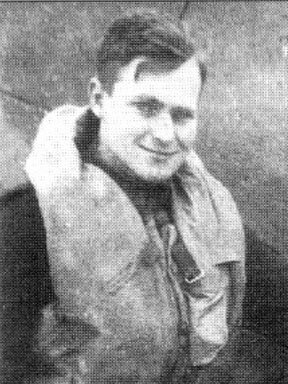 I left 616 Squadron and joined 312 (Czech) Squadron at Speke on 8th October, 1940, and had an immediate further victory. As I was taking-off in my Hurricane I saw a Ju 88 crossing the boundary of the airfield and I closed to 100 yards, opened fire and saw many strikes on the enemy bomber, which crash-landed close to the airfield. I completed the circuit and landed. I believe this was the fastest confirmed victory of WWII – the time from take-off to landing being about eight minutes. At the end of 1940 I was promoted to squadron leader and given command of 306 (Polish) Squadron, but only remained with them for four months when I was posted to 9 Group Headquarters. After a short spell as staff officer I took over 615 (County of Warwick) Squadron, AAF, based at Valley in Wales. Some bored pilot wrote to our Honorary Air Commodore, Sir Winston Churchill, complaining that the squadron had been out of the front line for too long. As a result, in September, 1941, we were sent to Manston in Kent, where, in our cannon-firing Hurricanes, we undertook low-level attacks against enemy shipping in the Channel. We had to contend with a lot of flak, both from the German merchant vessels and their E-Boats, and we had a lot of casualties. The length of the squadron tour, as ‘Channel Stop’ was supposed to be three weeks, but we were at Manston from 12th September to 23rd November, 1941. I myself was hit by flak, baled out, and was rescued from the sea just off Dunkirk. I was then promoted to wing commander and formed the first Typhoon Wing at Duxford. We took part in the ill-fated Dieppe Raid, during which I damaged a FW 190. After attending the RAF Staff College, where I managed to do some operational flying, I returned to lead the Typhoon Wing at Tangmere, consisting of five squadrons. In 1944 I was promoted to group captain to form 146 (Typhoon) Wing for the forthcoming Normandy Invasion. On D + 3 we operated from a Normandy airfield in support of the Canadian Army. This was interesting and exciting flying and after the break-out from the beach-head we started our long trek through north-west Europe. I had more action with 146 Wing, with its five squadrons of Typhoons, than with any other unit. On 29th December, 1944, I led an attack with two squadrons on a very special target in Holland. We had received information from the Dutch Resistance that the German Army were holding a high-level conference at their Army H.Q. at Bilthoven. The Typhoons carried out a most successful low-level attack with rockets and bombs and later we heard, again from our friends in the Resistance, that many high-ranking German officers had been killed and the H.Q. completely wrecked. On 28th February, 1945, I was posted to 84 Group Headquarters, but continued to fly operationally whenever I could. My last operational flight was with 123 Wing on 25th April, 1945. Soon after the war ended I left the RAF, but joined the South Yorkshire squadron as an Auxiliary and remained with them until the squadron was unfortunately disbanded. I flew Hurricanes, Spitfires and Typhoons in combat. At first the Typhoon gave a lot of trouble – both with the air frame and the engine – and we lost a lot of good pilots. However, once these faults were overcome it became a very tough and reliable machine and the very best gun platform. It carried bombs, rockets and, of course, cannons and you could hold a steep dive longer than the Me 109 or the FW 190. The Typhoon could withstand high ‘g’ – forces and its wide undercarriage was a great benefit on the rough airfields we had to contend with during our trek across France towards Germany.